(Host) A new report lays out four options for what to do about the State Office Complex in Waterbury, where flooding from Tropical Storm Irene left many of the buildings uninhabitable. And, as VPR’s Lynne McCrea reports, one option in particular appears to have a lot of appeal among some lawmakers and officials in Waterbury. 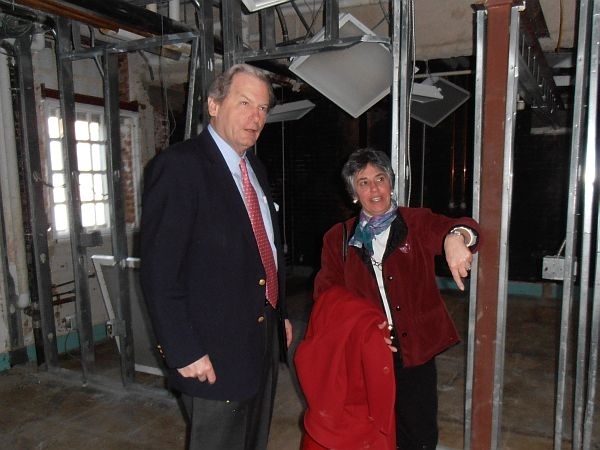 (McCrea) Over the past six months, Senator Bob Hartwell and Representative Alice Emmons have toured many of the damaged buildings at the Waterbury office complex. They chair the committees that will recommend how to best house roughly 1,500 displaced state workers. Today, Hartwell and Emmons walk through buildings at the back of the sprawling campus, closest to the Winooski River, where the damage was worst. (Hartwell) "That’s the river out there, and the water came right through." One option for rebuilding the complex suggests fully restoring these buildings. But another says these should be torn down. (Hartwell) "The two options – one is to come back here, re-use it the way it is, try to put it together the way it was when the storm happened. And the other way is to partially re-occupy and take some of the older buildings and buildings that are tired out. And create a much larger flood plain and floodway." (McCrea) Hartwell likes the second option because it would mitigate future flooding, but still preserve some of the historic buildings. Two other options suggest rebuilding outside Waterbury. Both Hartwell and Emmons see a lot of benefit in bringing people back to downtown Waterbury, where businesses have depended on state workers as their customers. (Emmons) "In terms of first blush, in going through it I think folks are feeling – ‘oh, we could do something with this current facility in Waterbury‘. That doesn’t mean that other options aren’t going to be talked about." (Hartwell) "We’ll look at all these options, but there’s compelling reasons to be careful about the Waterbury situation. One of the things that’s interesting about it – in addition to the historic issues – it’s the downtown emphasis, too. (McCrea) Of the four options, the report says rebuilding the most heavily damaged part of the campus would be the most expensive. Saving part of the complex and adding a building is the second most costly, at more than $130 million. Some state officials say the price is too high. Hartwell thinks lawmakers will also have to take into account how Waterbury would be affected. (Hartwell) "But you have to remember what else is at stake here. So, I don’t think the entire thing can be measured just in dollars." (McCrea) That sentiment is welcome news to Waterbury’s municipal manager, Bill Shepeluk. He, too, sees a lot of positives to the option that would demolish some of the campus and replace it with a new building that would be less prone to flooding. But he worries about projections that it would take three years to complete. (Shepeluk) "All of these potential projects look like summer-fall of 2015. And that’s a long time"
(McCrea) Shepeluk says village shops that have lost customers since state office workers left town are going to have to find ways to be creative to survive. And he predicts that at least a handful won’t make it. (Host) Legislative committees begin hearing details on the architectural report Tuesday. The goal is to make decisions by the end of April.